You probably take pumpkin pie from canned pumpkin for granted. You’re there, the can is there, there’s a pumpkin on the label… open it and mix it up with spices to make a pie, right? 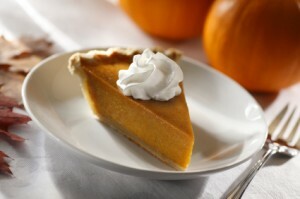 Ah, but a pumpkin pie made from a fresh pumpkin tastes so much better than the glop that was processed last year! Wash the exterior of the pie pumpkin in cool or warm water, no soap. Cut the pumpkin in half. Basically, you cut and scoop out the seeds… but SAVE THE SEEDS**, place it cut side down into a covered oven container. Cover the ovenproof container, and pop it in a 350 F oven. It normally takes about 45 minutes to 60 minutes (it can vary a lot! ); just test it periodically by sticking it with a fork to see if it is soft! Use the spoon to gently lift and scoop the cooked pumpkin out of the skin. It should separate easily and in fairly large chucks, if the pumpkin is cooked enough. To get a nice, smooth consistency, I use a hand blender. By blending it, you give the pie a smooth, satiny texture. Now you are ready to make your pie. I use Pillsbury’s ready to use crust from the refrigerated case because I am horrible at making pie crust from scratch. Of course you can use your homemade crust if you like. Whisk together pumpkin puree and eggs in a large bowl until smooth. Add sweetened condensed milk, cinnamon, ginger, salt, and nutmeg; whisk until thoroughly combined. Bake in the preheated oven for 15 minutes. Reduce heat to 350 degrees F and bake until just set in the middle, 30 to 40 minutes. A knife inserted into the filling, 1 inch from the crust, should come out clean. Allow to cool completely before serving. **Roasted Pumpkin Seeds – I made these for snacking on and to use in a few fall salads. It’s really simple, just clean them from the pulp; I did this by rinsing in a colander under running water. Then I melted 1 tablespoon real butter, 1 tablespoon honey and a teaspoon of season salt (Johnny’s) mixed together with the seeds and placed them on a large baking sheet and roasted on the top rack of a 250 degree oven for 1 1/2 hours checking every 2 minutes for brownness. They turned out beautiful and delicious.